Account of the historically significant old town of Belle Plain and of Belle Plain College grounds, in Callahan county, Texas. HERE IS EXCELLENT EARLY HISTORY AND GENEALOGY OF CALLAHAN COUNTY, TX. DR. C. T. KEYES DIES. 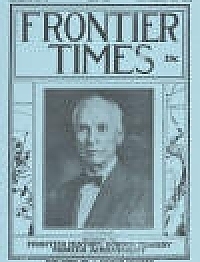 Obituary of Dr. C. T. Keyes, prominent physician of San Angelo, Texas for thirty-four years. Mentions: Central Grove, Miss * Miss Lillie Davis, etc. Recollections of old times in Bandera, County Texas. This subject, or what San Jacinto Day really is, may be briefly explained as the day on which the Battle of San Jacinto was fought when Texas won her independence from Mexico. On the other hand, the definition is far from adequate for to Texians the name San Jacinto represents the foundation on which rest the proudest memories of early Texas history. Here is the story of the great battle. A. J. Sowell, in the San Antonio Light, July 30, 1916. Fort Davis, county seat of Jeff Davis county, is situated at the foot of the Davis Mountains, and named for Jefferson Davis, president of the Southern Confederacy. The fort has its tragic frontier history. This is the account of the massacre of the Fort Davis troops, in the late 1870's. It has often been disputed that Jesse James and his gang ever operated in Texas. But there are accounts by those who knew that the James boys, Frank and Jesse, rendezvoused in Texas, and there is more than one incident that connected them with robberies in this state. The hold-up and robbery of the Austin and San Antonio stage on April 7th, 1874, is the subject of this account. The early preachers of West Texas rode horseback and carried their bibles in a pair of saddlebags. They knew how to quote scripture when fighting the devil; could also shoot a carbine as straight as anyone and, if needs be, could kill an Indian when said Indian was on the warpath.